Blog - Seasonal Cookie Guide | COOKIE...take a bite! You would be hard pressed to find someone who can resist the tempting nostalgic aroma of a freshly baked cookie. Cookies appeal to us all for many reasons. They’re perfect for on the go in a purse or backpack, come in a variety of flavors for any sweet tooth, and have the power to bring about a smile to just about any face. It’s no wonder then, why you’re more likely to find a delicious spread of cookies at your next company lunch, family gathering, or community function than any other dessert. 1. So. Many. Cookie Options. The flavor variety and combinations are practically endless. What that really means is there is something out there for everyone to enjoy. Cookies are like a sweet crunchy chewy canvas ready for just about anything you can imagine. Chocolate, nuts, fruits, and grains – just to name a few, create wonderfully contrasting flavors and textures that can satisfy even the most particular sweet tooth. If you’re a fan of the classics or wish to experience a bold new flavor combo, no matter what your taste buds happen to be craving, there is certainly a cookie for you. Another reason why cookies are the best: you can take them just about anywhere! Easily transport 1 or 100 cookies with ease to any event. Unlike other desserts, cookies do not require additional utensils or tableware. Simply pick up and enjoy. Whether you’re tossing a couple in with your lunch or feeding an entire congregation, cookies provide a convenient and favorable treat for any occasion. Plus, you can always bring the leftovers home for later! If you’re baking them yourself, you decide what size to make your cookies. If you’re not baking them, well you still get to determine your intake! Like many others, you may be watching what you eat and putting limits on your sweet tooth. Often, we pass up on dessert or a special treat… just because. With cookies, on the other hand, you can easily keep track of what you’re eating and indulge in a little treat. Enjoy yourself and know this: you’re allowed to have a cookie (or two). Cookies can come in a multitude of shapes, sizes, colors, and flavors. Consequently, it’s hard not to smile at the sight of a deliberately arranged platter of tasty sweet goodies. Bring some along to share with new acquaintances and co-workers to make a sweet first impression or maybe pass a cookie to someone who needs a little cheering up. For many, cookies bring back fond memories of childhood and time spent baking with loved ones. Whatever your reason, sharing a chewy, crunchy, crumbly confection is sure to brighten anyone’s day – regardless of age. COOKIE…take a bite! was born of a love for cookies. Baked fresh to order, every cookie we craft is bursting with flavor and just the right amount of sweetness. 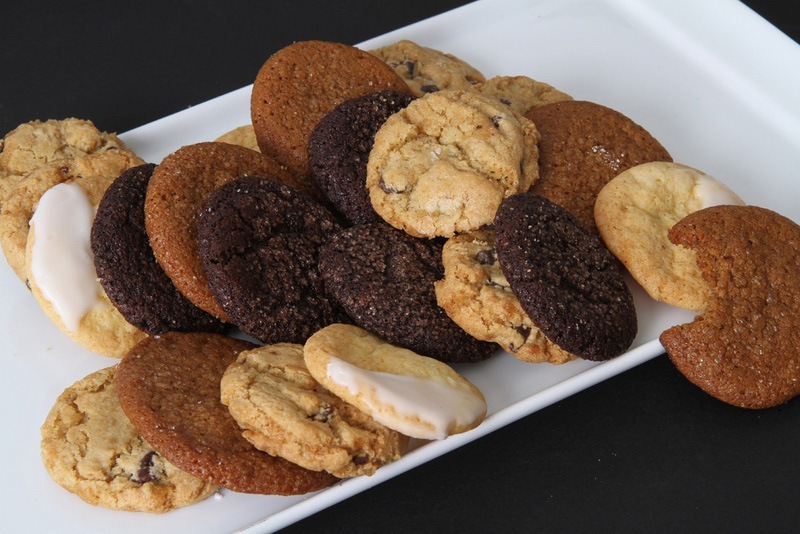 Learn how we can provide your next event or gathering with sumptuous mouth-watering cookies. We pride ourselves on our exceptional service and invite you to call, contact us online, or stop by our bakery in the Larkfield Shopping Center to see what we’re working on! Whether it’s that time of year or a just because occasion, sending out a token of your appreciation to your professional peers and contacts is always a welcome sentiment. If you’re stuck on what you could gift and are looking for something distinctly different yet altogether tasteful, then a personalized tin of freshly baked cookies may be just what you’ve been searching for. Our custom cookie tins and trays make for delightful treats that are fresh, natural, and baked to order. Bring a smile to any face and remain in the minds of every recipient. Foremost, giving someone a special gift is just plain nice. It’s a sign that you care about the people in your professional field, whether they’re an assistant, client, or executive. When you send a gift around the holidays or any occasion in between, it becomes so much more meaningful when the gift in question is personally selected and customized. It can help strengthen the bond between you and shows that you value their continued service or patronage. At COOKIE…take a bite we strive to create unique flavors and provide creative cookie options. Every one of our delicious cookies is sure to taste as good as they look. Our cookie varieties include vegan and gluten-free options in order to satiate the sweet tooth of those with dietary restrictions. Plus we utilize seasonal ingredients to craft delicious sweets that fit the occasion and come in many flavors to satisfy all cookie lovers!. With so many options, the hard part will be choosing which cookies to include! Talk about reinforcing your professional relationship. Sending a corporate gift around the holidays, special occasion, or just because is a wonderful way to market your company and encourage your clients or professional contacts to keep you in their minds. Not only can this increase your brand awareness, but it can also help you get unexpected recommendations from your current clients. Every sweet bite they take will remind them of your thoughtfulness and our customizable cookie tins may carry lasting staying power. With our custom cookie tins, you can create a wonderful gift that will delight your clients and professional contacts. Choose your logo design to place on the tin, pick out the tin style and choose the cookie flavors to fill it with. Get creative; include your company logo or theirs, along with a personal message to be printed directly onto our tins. You won’t be sending just any ordinary corporate gift you picked out at random, you’ll be gifting them personal appreciation and thanks for their business or partnership. Click Here for order minimums, set up charges, and process. Order Custom Gourmet Cookies Today! COOKIE…take a bite is a boutique operation creating small creative cookies that are big on flavor. 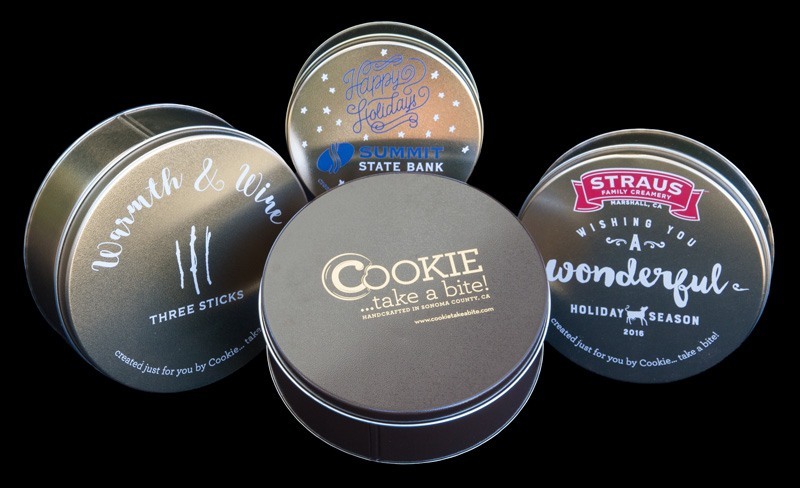 This year, we’re excited to offer personalized corporate cookie tins, perfect for the holidays or any occasion in between. Our Corporate Gifts & Custom Orders collection allows us to print your logo and message directly on our deluxe cookie tins. Give your clients a gift they will remember you by. To order our corporate cookie tins please call our bakery or order online today! We pride ourselves on the abundance of unique flavors and creative cookie options we create. We have everything from organic cookies, to vegan, to gluten-free and seasonal cookies in every color of the rainbow. We take flavor seriously, and each of our cookies looks as good as it tastes. With so many delicious options at your disposal, it can be difficult to decide which ones to try first! Not sure which ones to pick? We have you covered. Below we have crafted the ultimate guide to our favorite cookies. Hope you take a bite! Rolling past all that’s bland and boring, this exotically flavored cookie packs a refreshing, zesty flavor coupled with satisfying almond crunch. Did we mention it’s gluten-free and vegan? Yeah, dig in. Short of nothing, our Chai Shortbread Squares can multitask as a casual family treat or a sophisticated pairing to any delicious local wine. It’s filled with spices that will warm you right to the heart. Share with your family or coworkers with our ChaiShortbread Deluxe Cookie Tin. Talk about a bombshell! This Chocolate Cherry Bomb Cookie is a crowd favorite. This cookie features a delicate center and to-die-for chocolate and cherry flavor combination. For adult enjoyment, pair with any favorite Sonoma Pinot or try it with cold milk for your kids. Swirl into a heavenly sea of cinnamon spice and fresh pecans. This is a fantastic holiday treat and a tried-and-true crowd pleaser. Be sure to check out our Fall Platinum Tin if you’re stuck on gifting ideas but want to spread joy this holiday season! If it ain’t broke, don’t fix it. The Chocolate Chip cookie has been satisfying sweet tooths for decades, so we’re keeping it as a main staple of our lineup. The traditional recipe gets our own unique twist on it, boosting the chocolate flavor and adding an extra crispy edge. Chocolate chip aficionados will be sure to enjoy our Classic Chocolate Chip Tin. Fair warning, you might go coconuts for our Coconut Macaroon treats. They’re gluten-free bites of heaven that have a secret pinch of zesty lemon in every delicious morsel. Lovers of mint everything, we have you covered. The Mint Chocolate Kiss cookies will not leave you stranded in search of your daily mint fix. Generously infused with fresh mint and organic butter, it’s a rich, melt-in-your-mouth experience. 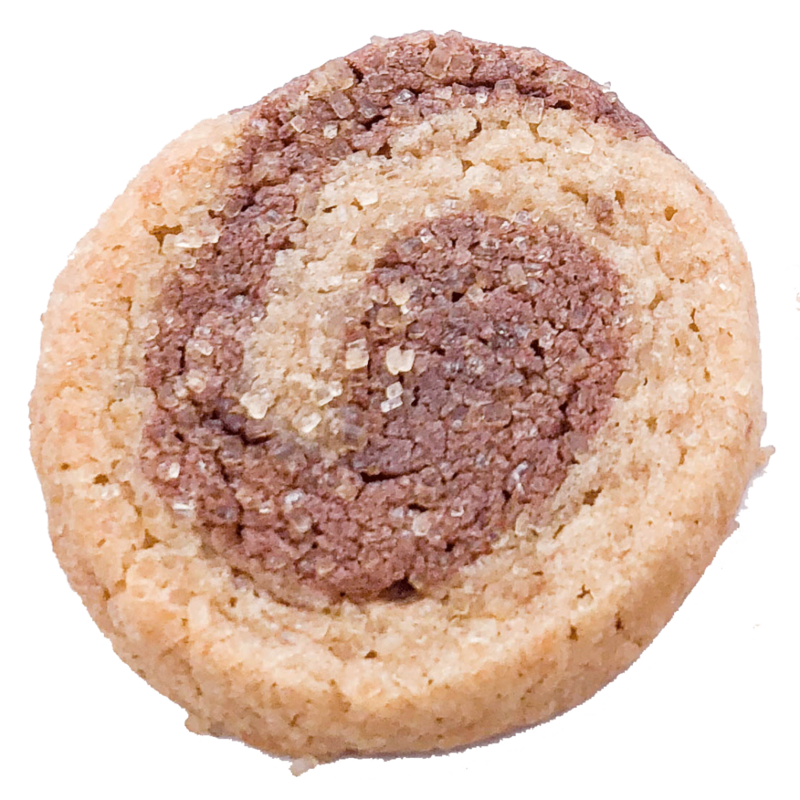 Ginger and spice and all things nice is a good way to describe our Ginger Honey Snap Cookies. They are filled with the freshest of ginger and infused with delicious locally-sourced honey. Added bonus: They taste wonderful with wine. 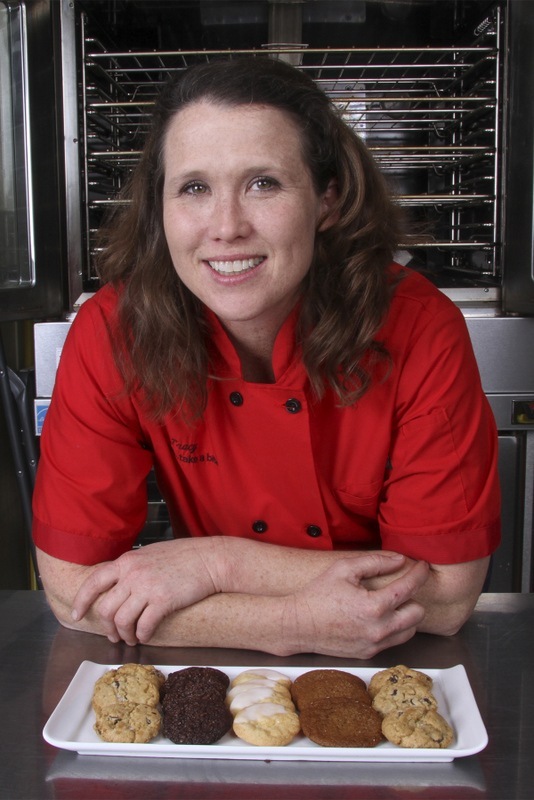 Our head baker has worked all over the world, providing high-end, delicious desserts. Her Aztec Hot Chocolate Crinkle is one of the many testaments to her worldly culinary talent. Enjoy this gluten-free treat year-round. Whether you’re going hiking and need a quick energy boost, or just want to get back to your homey roots, the Sonoma Trekker will do the trick. Filled with oatmeal and cranberries, it’s healthy and full of flavor! At COOKIE…take a bite! we pride ourselves on using only the best ingredients. That’s why we use local ingredients like Straus Family Creamery organic butter in our cookies. Our Snickerdoodle Sugar Sparklers are soft, buttery, and generously touched with cinnamon. Splash through your day with the Raspberry Chocolate Splash Cookie. It’s chocolatey and fruity with just the right amount of Raspberry fun! And if you’re hyped about this signature creation, you’ll be ecstatic about our Premium Variety Tin full of flavor favorites! If you’re looking for a refreshing twist over classic cookie flavors, our citrus and vanilla cookie will provide you with a truly invigorating flavor combination. If you have some citrus-loving friends or coworkers in your life, show them how much you appreciate them with our fresh and zesty Lemon Moon cookies. Gift them our deluxe Lemon Moon Cookie Tin for an ultimate gift. This half and half cookie embodies the ying and yang-type balance we all strive for in life. A perfect pairing of espresso swirled with sugar cookie dough makes for a coffee-lover’s dream of a cookie. What’s flour-less but not flavor-less? Our gluten free Peanut Butter Drop cookies are! Enjoy the touch of gray sea salt mixed with rich peanut butter. This is our Double Gold Medal Winner of the Sonoma County Harvest Fair! Stop what you’re doing and try our Triple ChocolateThreat cookies! These scrumptious cookies are packed with three different varieties of chocolate. This cookie is truly a chocoholic’s dream come true. If you just can’t get enough chocolate in your life, order our Chocolate Lovers Deluxe Cookie Tin to get your fix. What would a tea party be without delightful treats? Match our fresh zesty, pink peppercorn masterpiece with a cup of tea or a classy glass of wine. We won’t tell anyone. In fact, for all you wine lovers, we’ve even made our Wine Pairing Cookies Tin. 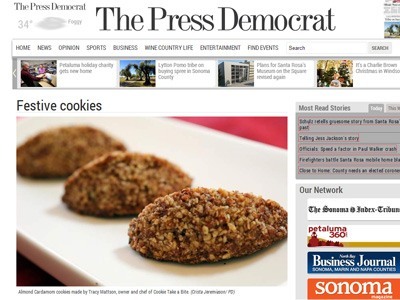 At COOKIE…take a bite!, we pride ourselves in providing delicious, organic and handcrafted cookies shipped nationwide. This year, we’re excited to offer personalized corporate cookie tin boxes for the holiday season! Our Corporate Gifts collection allows us to print your logo and message directly on our deluxe or premium tins. Give your clients the gift they will remember you by! To order a corporate cookie tin please call or order online today. 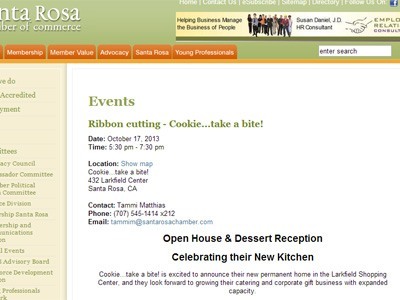 Ribbon cutting – Cookie…take a bite!